CNN has no problems showing anti-Semitic cartoons or US soldier snuff films. Today CNN whited out a pencil sketching that may be offensive to some of their viewers. 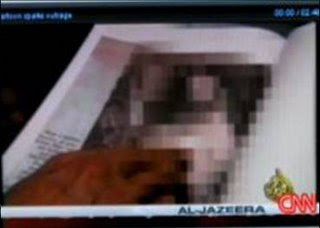 CNN certainly wouldn’t want anyone to go on a crazy murdering rampage after they aired such a disgusting image. After all, Muslims in Turkey have already attacked over 5,000 Swedish websites after the image appeared in a newspaper. But, being overly sensitive to Muslims while ignoring everyone else is nothing new for CNN. 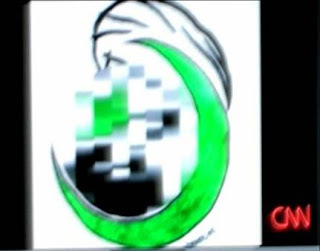 In 2006, CNN and Aljazeera decided it best to pixilate Mohammad out of pictures in a segment they aired “so as not to offend” anyone. And… This cartoon with Mohammad with a bomb hat was also pixilated so as not to offend anyone. But, again, showing a US soldier snuff film is OK with CNN. They have to draw the line somewhere. Gates of Vienna has more on today’s cartoon story. 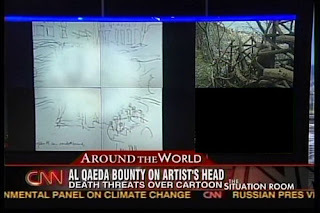 Doug Ross takes another look at CNN’s cartoon report.